If you’re looking for a practical yet beautiful wall clock for your home, you’ve come to the right place. We’ve trawled the web and found what we think are the best 26 wall clocks. From modern to rustic and metal to glass, we’ve curated an awesome list of products for you to check out. All of the clocks listed on this page have been curated and independently chosen by the people behind Gifted Geek. This DIY wall clock features a pretty large size that allows you to tailor it to your décor. The acrylic mirrored surface adds style and elegance to a modern home. It comes with a non-ticking feature for a quiet night while reducing the amount of energy consumed. The package provides self-adhesive stickers and an auxiliary scale ruler to help you install the wall clock easily. Additionally, the mirrors come with a protective film that you can tear off after you have installed the clock. 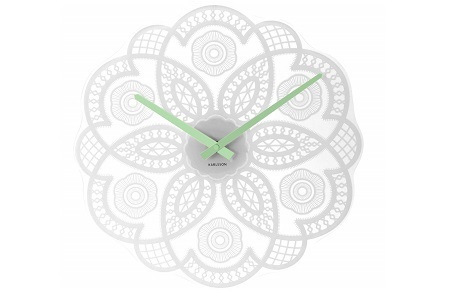 Decorate your home on a budget with this beautiful sun-flower shaped wall clock. 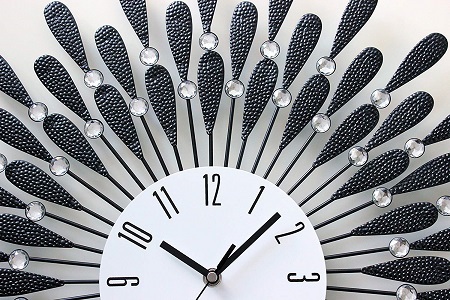 Its round clear-shaped diamente blended with black metallic spikes and chrome dial match with any modern home décor. The numbers are easy to read, and its size makes this wall clock a good focal point for your home without overwhelming the space. In addition, the entire clock has a diameter of 50 cm while its face measures 16cm in diameter. It is available in black and white. 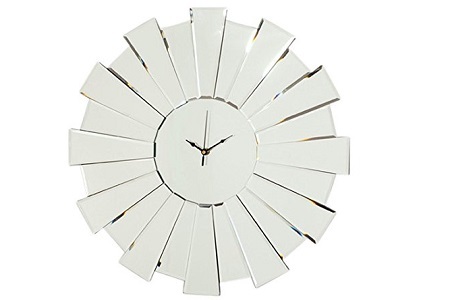 Add glamour to your kitchen space or dining areas with this funky kitchen clock. Its metal finish ensures it stands the test of time while adding a touch of style and elegance to your home. 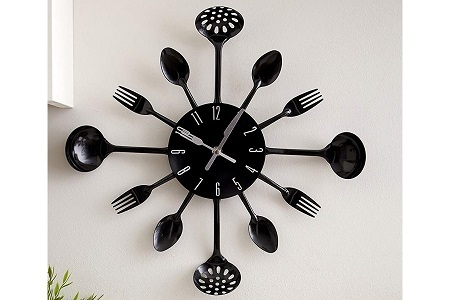 The kitchen clock features fork and knife hands while the numbers are matched to a fork, spoon, straining spoon or ladle to enhance the quirky cutlery design. It has a considerable size as it measures 43cm in height, 42cm in width and 5 cm in depth. What’s more, it is easy to clean as you only need to wipe it using a soft cloth. 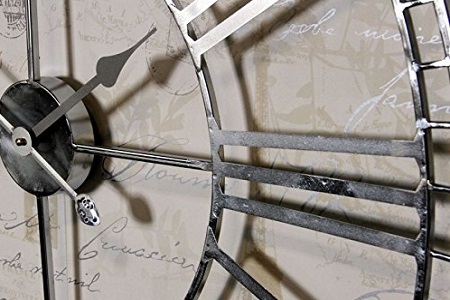 If you are a fan of industrial-styled home accessories or the old Roman numeral clocks, this Nickel Wall clock is for you. The polished nickel edge finish and attractive architectural design breathe sophistication without overwhelming a space. You can hang it in your living room, bedroom, kitchen, or hallway and it with quickly blend in with the design scheme. The slight imperfections of pierced metal digits add to its rugged, industrial look while enhancing the contemporary style of a modern space. It makes a great focal point for your living room or other space using a vintage design theme. 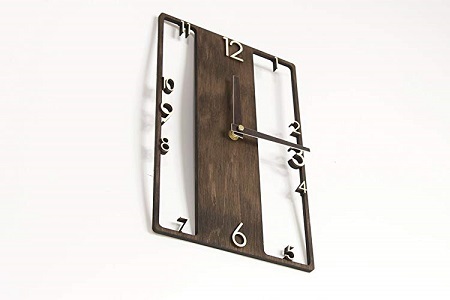 The clock has a rustic style of modern wooden clocks while the birch plywood and the dark-brown colour allow you to personalise your décor in a simple, unique way. Unlike most wall clocks that take on a circular shape, this wooden clock has a rectangular shape, which mimics a framed clock. The hands and the numbers are carefully crafted, showcasing the great artistry and sophistication of this modern wooden clock. 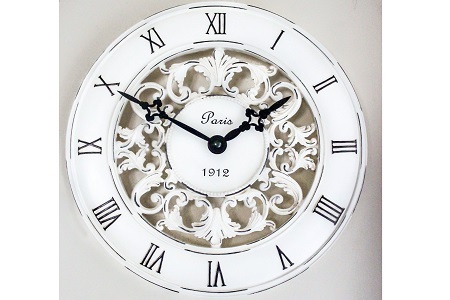 If you are an enthusiast of Paris décor, this rustic Café wall clock completes the look. The stunning graphics etched on the MDF board create a warm, welcoming ambience to any space. It features the famous La Maison design that combines complex movements of the Parisian style with Swiss watchmaking expertise. The clock measures 34 cm, which is pretty small if you are looking to make it a centrepiece. 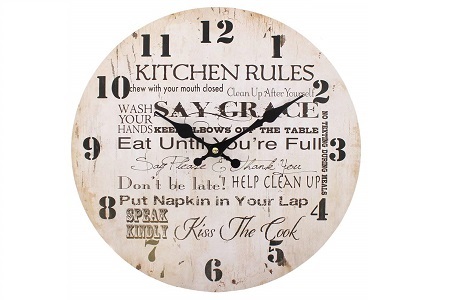 This vintage style wall clock makes a perfect gift for friends and family who love the kitchen. The kitchen rules etched on the MDF board make a fun way of reminding them about what is expected. It features a shabby chic style with a distressed vintage feel. The colour of the MDF board used to design this clock creates a warm, welcoming ambience. 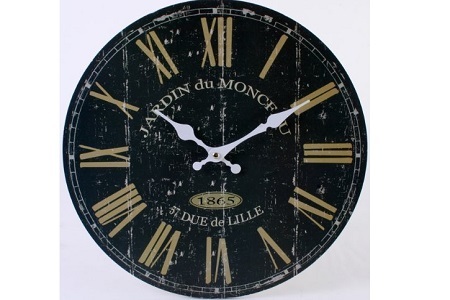 Add a touch of class and style with this large, rustic French wall clock. Its vintage style with white hands and golden numerals create an eye-catching centrepiece for your living room. The clock features a 3D wood planking construction that is cleverly hidden using a faced print and a striking large size. It has a dark distressed face, which when blended with the golden numerals on the MDF board, add character to an antique collection. This makes a great gift for a friend or family. 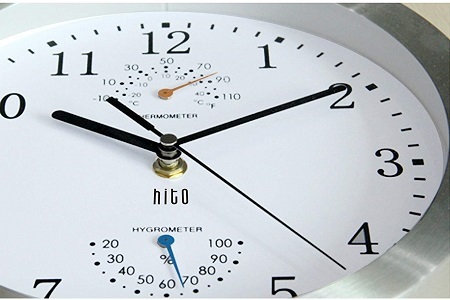 If you are looking for a non-ticking wall clock, the Hito modern clock is just perfect. It features high-quality Quartz movement that guarantees accuracy and steady performance at all times. Another striking feature about this clock is its signature look of large black numerals and hands amplified by a white clock face, making the Hito wall clock ideal for a classic, modern décor. Additionally, the use of white and black creates a calm, tranquil ambience in your bedroom, kitchen or office. 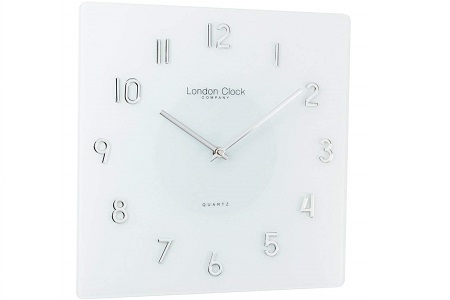 Add glamour to your home with this sleek, stylish and square wall clock. Its bevelled silver-coloured surround and white face blend in with any colour scheme of your home while the 3D black numerals sit away from the face, creating a unique feature of design impact. The clock’s second hand is fitted with Rhythm’ Silent Silky Move setting that eliminates ticking. It measures 25cm by 25 cm, which is a reasonable size for a small space. The face of the clock features a rugged wooden build made of MDF. Also, the curious kitten peering at you with snooping green eyes add to this clock’s cockiness while the kitten’s tail that hangs down functions as a pendulum. 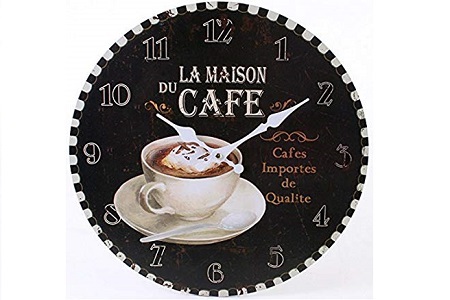 The phrase at the center of the face clock ‘le petit café de chat noir’ adds charm to your space. 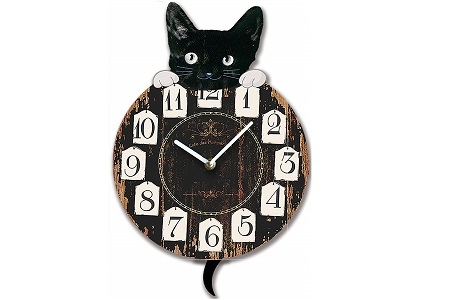 This wall clock makes a fantastic gift for a cat lover. 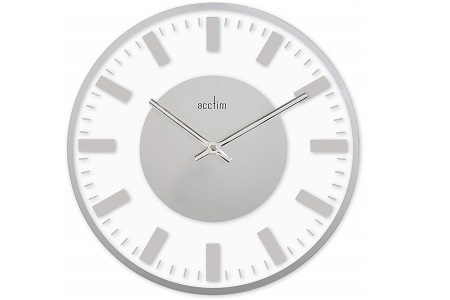 Acctim wall clocks have similar designs, quality, functionality and come with a 1-year guarantee. The Stefano wall clock is a perfect example of Acctim’s combination of style and functionality. It features a glass dial blended with metallic hands and a mirrored centre, making this wall clock ideal for a modern home. However, if you have a problem with ticking wall clocks, you should consider hanging it in the living room and kitchen and not the bedroom. It is also powered by Quartz movement, so you are sure of accurate time delivery. This clock measures 320 mm in diameter. 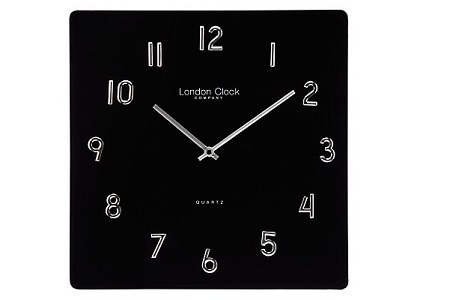 This London Clock Company wall clock blends in perfectly in a minimalist space. The white face, frosted finish along with the crystal clear hands and chrome numbers match the characteristic black and white colours for modern minimalists. It measures 35 x 35 cm; a good size for hanging in your bedroom. The hands are made of brushed steel, which retains most of the metallic lustre and the clock’s glistening appearance after a long period of use. The Black Glass clock is one of London Clock Company’s vast collections. 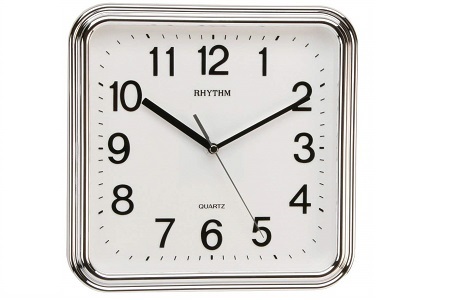 It has a square shape; an analogue design for most wall clocks. This analogue design is reminiscent of the Scandinavian style used on most London Clocks, which is often characterised by functionality, elegance, minimalism and simplicity. Its Arabic dial, standard clock hands and dark clock face creates a stylish and practical accessory for hallways, bigger rooms and other common areas. 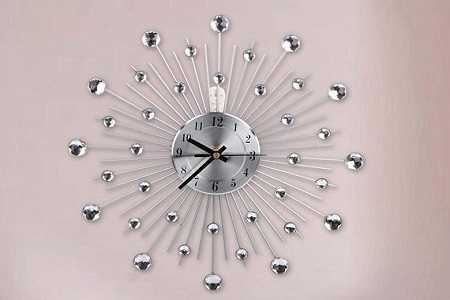 This round-shaped modern wall clock makes a perfect accessory for a living room, hallway, kitchen or conference room. The clear diamante crystals fitted on the coated metal rods add to its style and sophistication. It is made of iron, aluminium alloy and frosted glass, which adds to its sturdiness and durability. The large and small metal rods break out from the monotony of similarly sized rods. The clock dial is made of a round aluminium alloy with accurate time signs and clock hands. This Karlsson clock is just the perfect centrepiece for your office or home office. Its name echoes the stunning printed moon graphics used on the piece. 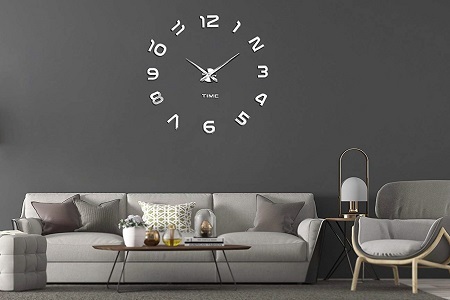 The grey and dark colours on the face of the clock create a sense of identity and a calming ambience in a home or office while the black and white hands blend in well with the rest of the graphics. This analogue wall clock is powered by Quartz and boasts a silent continuous movement. The clock makes a great gift for astronomy or space enthusiasts. This glass clock makes a simple and unusual accessory for decorating your living room, hallway, or bedroom. Its mirrored finish and bevelled segments add to its sophistication and exclusivity. The back and the hands have a dark colour to balance out the cream shade on the clock’s face. It comes with a fully flocked back that has pre-fitted hangers. In addition, it measures 55 cm in diameter, which is pretty reasonable if you are planning to make it the focal point of your living room. 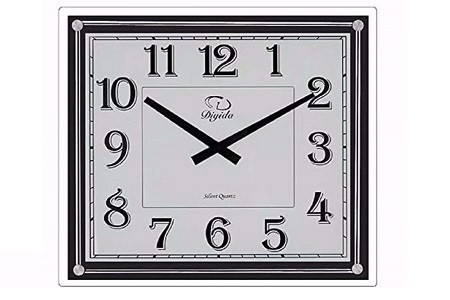 The clock uses high-quality quartz clock movement. The clock features a lovely antique white colour that is ideal for homes, blending a modern theme with a vintage look for people looking to accentuate walls with dark-painted shades. Its colour breathes a streak of elegance despite its countryside flare while the Roman numerals and the quotes on the face echo the chic French style. The round design allows you to see through the beautiful lattice design in the middle. It comes mounted on a board hence, a little over two pounds in weight. Karlsson, a reputable Dutch clock brand is known for its exceptional manufacturing standards and the use of quality materials. This piece is the epitome of the Karlsson brand. Its aesthetic design, stunning graphics and innovative shape echo this brand’s elegant wall clocks. Its laced cut-out effect shows great artistry, which is ideal for a contemporary home décor while the green-coloured hands break the monotony of the bright face of the clock without overwhelming it. The clock is powered by an accurate Quartz movement and measures 38 cm, which is a pretty reasonable size for your living room, bedroom or other space. 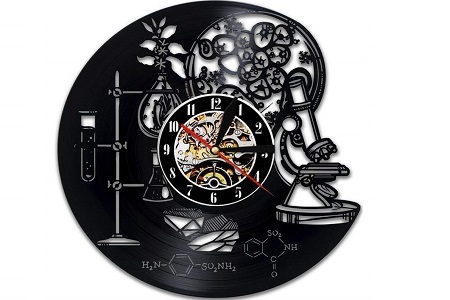 This wall clock is truly unique, it’s made from an original vinyl record and is themed on science and chemistry. This is an eccentric and quirky design and we’ve never seen anything even remotely similar. Needless to say, this is one of our favourite products. For a truly one of a kind wall clock gift, consider this chemistry clock. This is a quartz powered device and is silent so is perfect for bedrooms or other quiet locations around the home. This novelty clock makes a great gift and home accessory for a garage, student room, teenage bedroom and office due to its unique features. 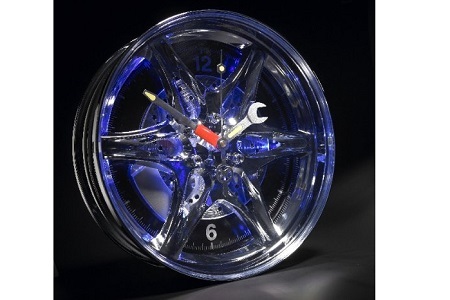 The clock features a car theme of a rimmed tire with one hand taking on the shape of a screwdriver and the other of a spanner hinged on a bolt-like screw. Its neon light, which you can turn on and off, along with the beaming blue neon nuances that glisten in a dark or dimly lit room, add to its uniqueness. The wall clock provides a perfect combination of beauty and functionality. The design of the surround, Arabic numerals and hands feature exquisite craftsmanship and artistry that add to this clock’s beauty. Apart from hanging it at home, you can hang it on a restaurant wall, office, café, hotel décor or a bar without overwhelming the space. The package comes with a back hook for easy installation. Wooden clocks and wall hangings have become pretty popular in modern décor. 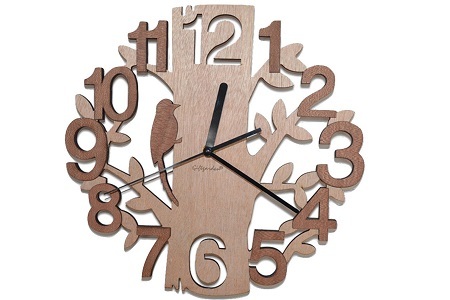 This tree-shaped wooden clock is just what you need to complete your vintage-themed and other contemporary décors. Its natural wood and handmade artistry blend in well with the rest of the furniture while the high-quality wood ensures it does not warp easily. The wood material has complied with the Europe E1 standard, making it safe to use around kids. The scene effects and Arabic numerals use an AA battery, which is not included in the package. With the Asvert Modern DIY wall clock, you no longer need to buy a large wall clock to accentuate your living room. 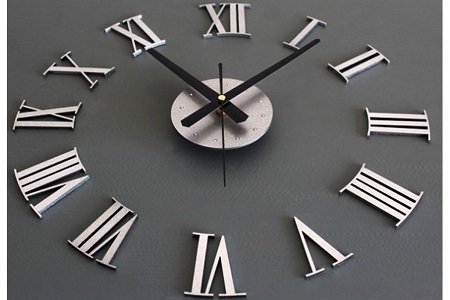 It has a diameter range of 60 cm-130 cm that allows you to customise the clock to your desired height. The clock’s acrylic mirror configuration and its high-quality EVA foam material allow it to look fresh after 5-7 years of use. It comes in different styles and colours to suit various design themes. This clock sticks easily on any surface. 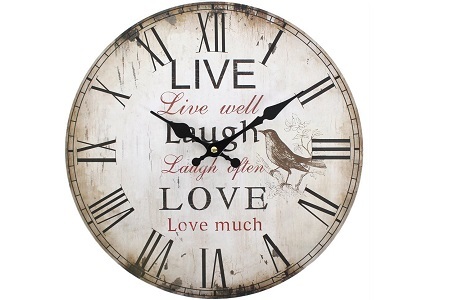 If looking to complete your vintage themed home, this Live, Love and Laugh clock makes a great addition. It features old Roman numerals on a stained MDF board and a shabby, rustic appearance that creates a distressed vintage feel. However, the quote ‘Live well, laugh often and love much’ makes a beautiful, soothing quote that fills your space with optimism. What’s more, unlike other Roman-themed numeric clocks that tend to be noisy, the Live, Love and Laugh clock is very quiet when ticking. The clock is a great combination of a home accessory and a practical home indicator. This is ideal for displaying friends and family photos while adding an elegant feel to your living room, kitchen, office, or bedroom. Its frame is made of high-quality plastic with a glossy finish that adds to its chicness. The 12 photo frames attached to the clock consist of 4 large frames and 8 small ones located at the 3rd, 6th, 9th and 12th hour. It comes in a gift box packing that is just perfect in case you are planning to offer it as a gift to somebody special. 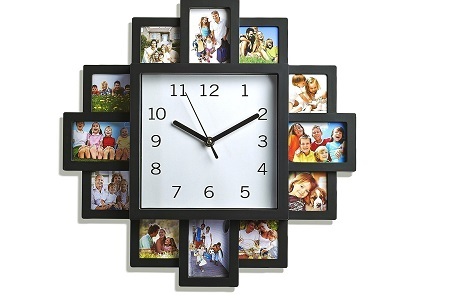 What Do You Think of Our List of Awesome Wall Clocks? 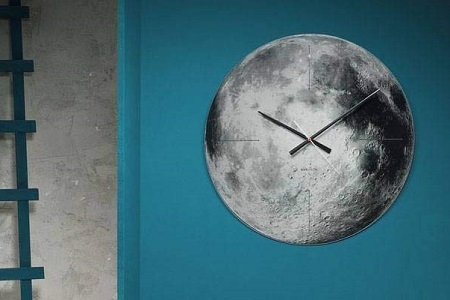 The team here at Gifted Geek had great fun sourcing these awesome wall clocks. We think they’re all fabulous and would look perfect in any home. With so many beautiful wall clocks to choose from, we don’t think you’ll have any problems finding one from our list. If you have a suggestion, perhaps an awesome clock that we’ve missed from our list, contact us here.